Forged in Dreams and Magick: 5 Signed Copies and Other News . . . There are many exciting news items to report from the Kat Bastion Writing Desk, the first of which is a giveaway on Goodreads for the first 5 signed paperback copies of Forged in Dreams and Magick. The Goodreads Giveaway runs through September 26, 2013, which is the Thursday of release week. 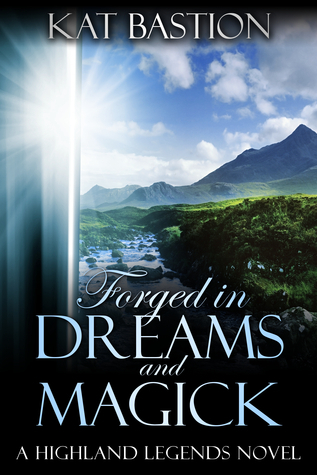 Add Forged in Dreams and Magick to your Goodreads shelves by clicking on its title and sign up for the giveaway with the “giveaway” or “enter to win” links in the widget below! Giveaway ends September 26, 2013. AToMR Tours will be posting sign-ups for the Forged in Dreams and Magick Release Event Tour and the ARC Review Tour by next week. I’ll share the links of the tours once AToMR posts them. Also, Bound by Wish and Mistletoe, the companion holiday novella in the Highland Legends Series, was sent to my editor on Monday. The romantic adventure has come together beautifully at about 45,000 words and will be released early this November, 2013.